Review: For the latest club-rocking adventure on his re-born Skeleton Recordings label, DJ Monita has decided to showcase cuts from two different artists. 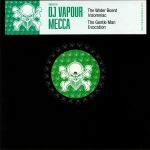 Reading resident DJ Vapour handles the A-side, first serving up the powerful sub-bass and revivalist jungle drums of "The Water Board" before turning his hand to bone crunching hard-step on the paranoid and creepy "Insomniac". Mecca steps forward on side B, offering up two similarly dark and bombastic cuts. Our pick of the pair is the horror movie-inspired insanity of "The Gentle Man" - all ghostly electronics, weighty sub-bass and scattergun breakbeats - though plenty may prefer the even more intense and full-throttle ride that is "Evocation". 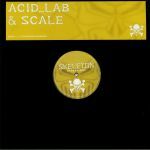 Review: If you're after bowel-bothering, pant-wetting junglist darkness, DJ Monita's Skeleton Recordings label is always a good place to look. Certainly, there's plenty of moody, full-throttle fun to be found on this double-header. Jem One handles the A-side, serving up the creepy horror-jungle bustle of "Footsteps" - all razor-sharp old school breaks, dystopian vocal samples and macabre aural textures - before opting for a more hot-stepping feel on the equally as intense "Frequency". 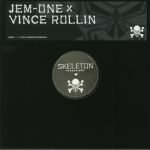 Australian jungle revivalist Vince Rollin gets busy on the B-side, peppering a wild rhythm track with end-of-days noises and mind-altering sub bass on "Prometheus", before joining the dots between original jungle and neurofunk on punishing EP closer "Symbiosis". Review: It was only a matter of time before Response & Pliskin found themselves on Skeleton. Chowing down the vapour trails of their Western Lore EP comes this crucial, caustic dispatch on Monita's legendary imprint and the results speak for themselves: "Raging Bull" lives up to its name perfectly, all crashing breaks and unrelenting energy, it's a full drum assault with no letting up. "Spinster" continues the classic jungle theme with a rhythm that screams 1am at Rupture... Especially as the deeper, emotive elements breeze into the blend mid way. Finally we strike another well tailored title as "Small Hours" rolls us deep towards dawn, as its rattled breaks and deep breathing pads instantly ignite a light footed and rushy sensation. Precision.